Water line cleaning and medicating are a snap with Dosatron’s livestock medicators. Accurately medicate your hogs, chickens, and other animals at any age! Keeping your animals healthy and free from disease is vitally important to your agricultural business. That’s why livestock growers and integrators have been turning to Dosatron for trusted experience. Our medicators are the most reliable, easiest way to medicate your livestock drinking water accurately and with minimal maintenance. Click here to view photos of Dosatron medicators working in the field. With a variety of motor sizes and designs, Dosatron can meet almost any medicating need in virtually any type of livestock operation – from the largest of poultry and pig houses to the low flow needed to medicate day-old chicks and weaners, from growers using feeder tanks to those operating in hard-water environments. Dosatrons are easy to install and maintain, so you can spend less time worrying about your equipment and more time tending to your business. Discover our NEW Mini Maintenance Kits for the user who performs maintenance on a regular schedule. The kits include recommended maintenance parts and Dosa-Lube. Dosatron also goes beyond medicating to help with water line cleaning, water treatment, egg washing and sanitation of animal containment areas. We also have solutions for boot washing and sanitizing foaming applications. If you’re looking for a versatile solution that will help you get the most out of your equipment investment, then Dosatron is the perfect choice! Below are the most common ways to install and use your Dosatron. WHAT DO DOSATRON MEDICATORS ACCURATELY INJECT?
. . . is the original flat top! 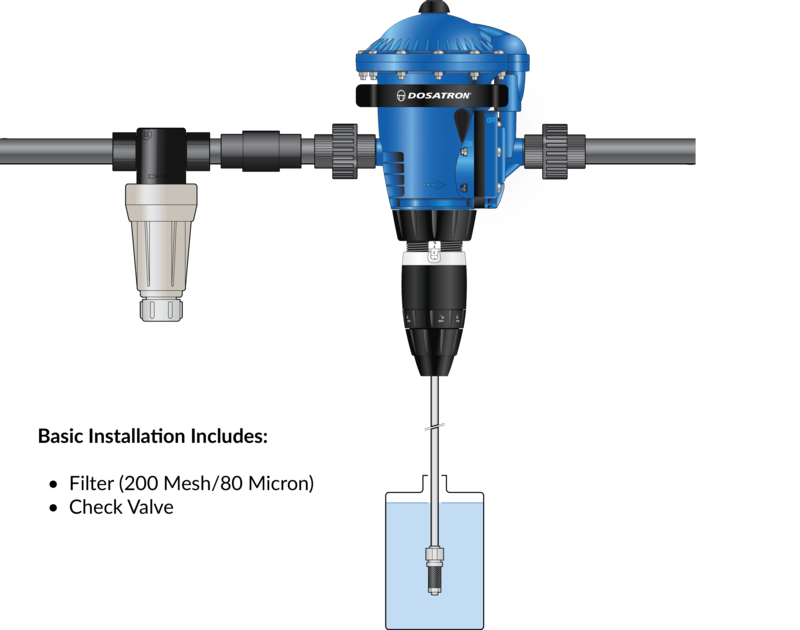 The D128R is a long-time industry favorite, known for its dependability and ease of use.
. . . is perfect for when you need a higher, 11 GPM flow rate at a steady 1:128 ratio.
. . . is a versatile, adjustable injector allowing for a variety of applications, such as water line cleaning, that require different injection rates. The Mini Maintenance Kits are the perfect, economical solution for Medicator users who perform maintenance on a regular schedule. They can be used as often as necessary to ensure that your Dosatron Medicator injects accurately and runs smoothly. The Mini Maintenance Kits are available for the DM11F and D45RE15. 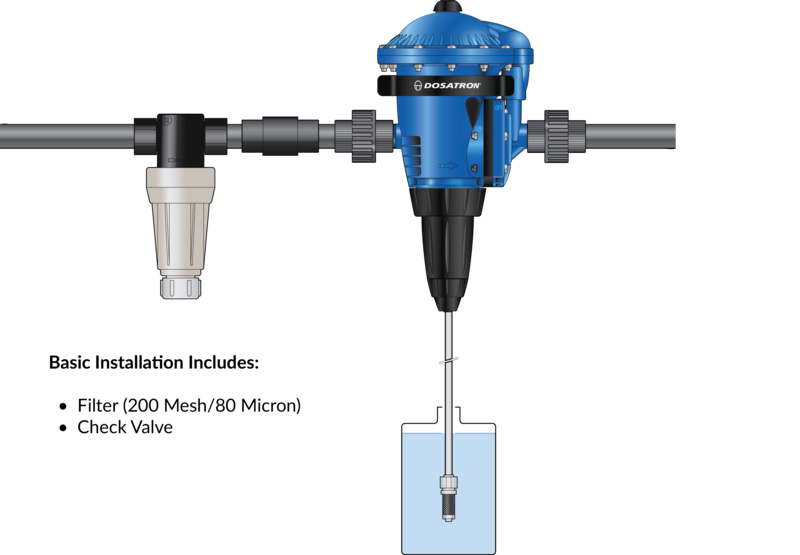 "Outdoor hydraulic bypass injection solutions with Dosatron." "So fresh and clean. Just want to take the time to thank Dosatron. Your product support is amazing!" "This is how the Dosatrons we use work: driven by water pressure and not by electricity, this feeding system will continue to operate even during blackouts. The system is easy to install and removes all the reservoir work from growing, freeing your time to be able to focus on your plants more personally. It also allows for you to dial in better and be able to rule out contaminated resi factors, in the event of an issue, narrowing down your process of eliminations. Thank you, Chris, for lifesaving equipment and personal guidance installing — worth every dollar and some!" "Big thanks to Chris at Dosatron for coming through and training. The manifold in this room supplies two rooms and allows you to choose from up to three feed regimens that are controlled by three different Dosatron panels." "Dosatron injectors are simple, consistent and dependable, but what really sealed the deal was the excellent after-sales support. Ever since our first purchase, Dosatron has been on-site several times to train our lead personnel. Thanks to Dosatron's expertise, we've been able to reduce chemical and water consumption, which helped our bottom line." "Dosatron is one of Mister Car Wash's preferred dispensing pumps of choice with over 1,000 units in operation throughout our 105 plus locations nationwide. It allows us the variability to dilute our chemistry up to a ratio of 1500:1." "Just a note to let you know how satisfied I am with the performance of all the Dosatron pumps I am using. I have over 30 in operation right now and they need little or no attention at all." "I used Dosatrons at our first carwash and liked them. For the second wash I tried Hydraflex but it was too unreliable, complex, and expensive! I went back to Dosatrons for our third carwash and I am very pleased with the cost, reliability, and ease of use." "I just felt compelled to tell you that every time I speak to anyone at Dosatron, I'm impressed at how well everyone knows their product lines, part descriptions, and numbers, along with technical details." "Great machines with great success. Dosatron just keeps on going!" "Portable, versatile, and dependable... our Dosatron injectors keep our crops looking good!" "If our etch and fountain solutions aren’t precisely mixed, my press room staff struggles. With Dosatron, hundreds of variables are wiped out by a single piece of equipment, so our mix is reliably precise. I can’t say enough good things about Dosatron!" "Dosatron is perfect for drip line fertilization. Best of all, it's water-powered, so it's sustainable AND saves us time and money!" "For more than 15 years I have installed Dosatron fertilizer injectors in every new greenhouse location. They're accurate, reliable, and simple to operate!" "Essential for keeping plants fresh in our retail stores; that's why we have 42 Dosatrons!" "We have been using Dosatron fertilizer injectors proudly for over 20 years. They are easy to use, simple to maintain, and no one can match their service!" "Chemistry is a critical and important part of our process. Our Dosatron Pumps have a lengthy track record of consistent and reliable performance." 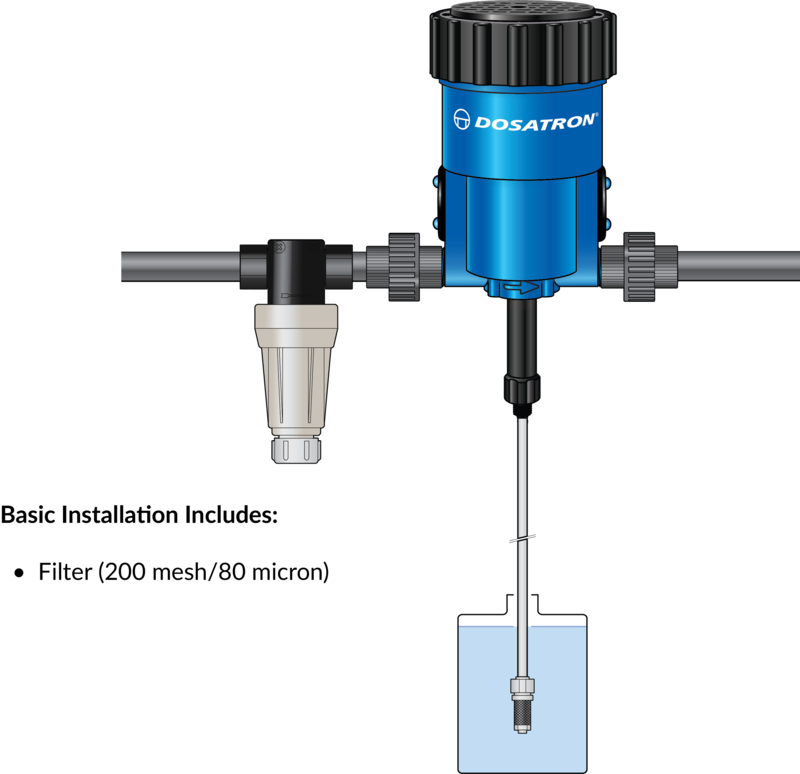 "Dosatron chemical injectors provide customer satisfaction with their hassle-free operation and consistency. Dosatron's accurate injection has saved us 25 - 30% on polishes and I'm not dealing with plugged orifices." "The DM11F Diaphragm provided excellent results . . . and will pump on baby chicks at day one. This is the best medicator I have ever used." "I've been using the DM11F Diaphragm injector for about a year, and it works great, even on day-old chicks. And I can keep on using it, throughout the birds' entire life cycle. I've used other injectors, but the DM11F is the best one I've tried." "I've been using Dosatron for over 10 years, and I'm very happy with their product. I've tried other fertilize injectors, but Dosatrons just work better. That's why I'm a loyal customer!" "Dosatron makes a difference with our extraordinary plant material." "Click clack all day, every day!"